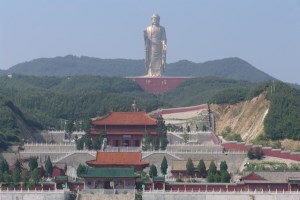 The Spring Temple Buddha (chinese: 中原大佛 Zhōngyuán dàfú) was the world’s largest statue until November 2018, and has been listed in the Guinness World Records. 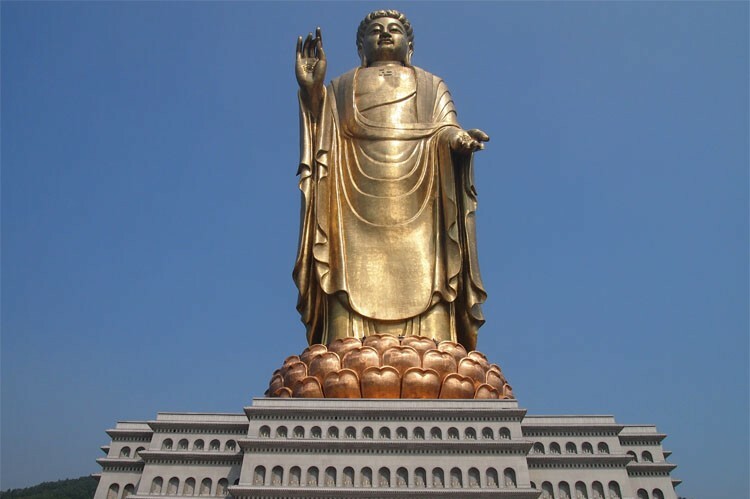 Depicting the Vairocana Buddha, it stands 128 metres (420 feet) tall from the base of the lotus pedestal. 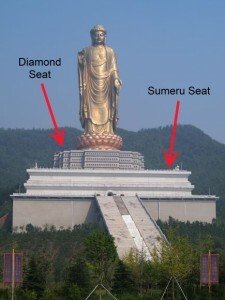 This in turn stands on two structures, the “Diamond Seat” and the “Sumeru Seat” – which, if included, brings the total height to a staggering 208 metres. Despite its record breaking height, the Buddha remains a largely undiscovered wonder of the world hiding away in a remote part of China’s Henan province. On the day the lone traveller arrived, there were only a handful of visitors all day – and no other western visitors. The fact that the statue is a 2 hour bus journey from the nearest town of Lushan, and with Lushan itself being a small town far from anywhere else, the statue may remain in hiding for a while yet. Situated in what is known as the Fodushan Scenic Area, the Buddha clearly stands out as the main attraction. However there are a couple of other smaller things to see – the Foquan Temple below the statue, the Bell of Good Luck, and for the really adventurous the Yaoshan Fuquan hot spring centre. The Buddha itself is huge – it is made from 108kg of gold, 3,300 tonnes of copper alloy and 15,000 tonnes of steel, and for an additional cost visitors can go right up and touch its toes to really get a feel for just how large it is. To reach the statue there are two large sets of stairs to climb – each with 365 steps. Additionally, once inside the lower building there are more stairs. In total you will be walking up over 1000 stairs! If that sounds like too much effort then for a small price there is a mini bus that can take you to the top (catch it after walking through the temple). The construction of the Spring Temple Buddha was announced after the destruction of the Bamiyan Buddhas in Afghanistan by the Taliban in 2001, which was condemned by the Chinese government at the time. The statue was completed in 2008. 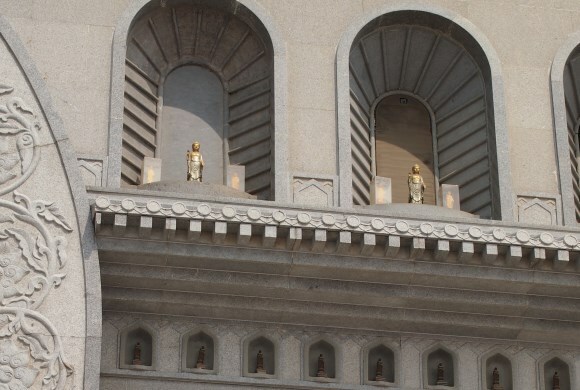 Further plans were then announced to create the two buildings underneath the statue – the Diamond Seat and the Sumeru Seat, by literally reshaping the hill on which the statue stands. If something is done in China, there are no compromises! Finally, the stairs up to the statue were built. As of 2014, both the Diamond and Sumeru seats are externally finished but internally under construction. It seems that the entire area was constructed with the expectation of enormous numbers of visitors. Perhaps the low visitor numbers are the reason why these two buildings remain in an incomplete state. The Diamond Seat is an interesting building itself. It is made up of five levels, each containing many small shrines holding small scaled-down golden Spring Temple Buddhas. There are over 5,000 shrines containing 6,666 mini Buddhas! 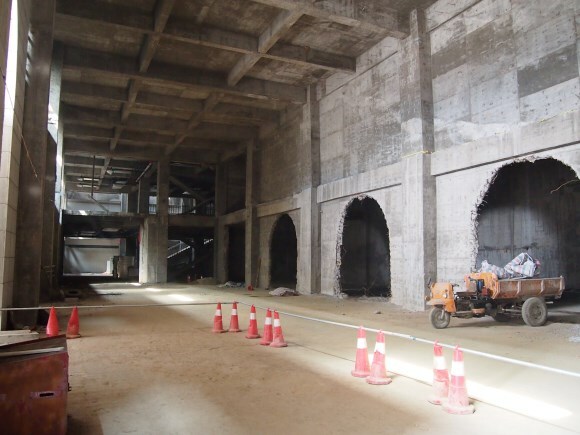 Although as of 2014 the internal construction of the Diamond Seat building is incomplete, tickets are available to enter it and catch a lift up to the top of the lotus pedestal, where visitors can touch the toes of the great Buddha. Children under 130cm receive half price entry. Opening hours are 08:00 – 17:00 daily. Hi! I’ll go in november, but I’m don’t finding transportation from Louyang to the Spring Temple. Could you help me, please? Thank you!! Its a real SALUTE to Lord Buddha. Hi! Thanks to this page we are going to look for the Spring Budha in our trip to China. We are two mexican girls and we will head there following your recommendations after our visit to Xi’an. My question is about where do you suggest spending the night? In Lushan? After the Budha, we will be going to Shangai. I hope to hear from you since I dont see any comments in this section since a couple of years. It’s no longer the largest statue. When it was constructed ? Wikipedia says it was started on 1997? Good question! On the site I mention construction beginning in 2001. There is conflicting information on this, and as you mention the Wikipedia entry says 1997 but this figure has no citation. An alternative Wikipedia entry https://en.wikipedia.org/wiki/Buddhas_of_Bamiyan mentions the destruction of the Bamiyan Buddhas in Afghanistan in 2001, followed by the Chinese announcement of the Spring Temple Buddha. Also I have not been able to find any references to the statue prior to 2001 – so I’m much more inclined to believe the 2001 figure than the 1997 figure, although if anyone has any cited information to back up the 1997 figure I’ll be happy to have a look. Copyright © 2019 www.springtemplebuddha.com. All Rights Reserved.